New York, Nov. 20 - Speed and versatility overcame superior strength and punching force when Beau Jack defeated Philadelphia's Bob Montgomery in 15 bruising rounds at Madison Square Garden last night and became the second fighter in the history of the lightweight class to recapture the world championship from the man to whom he previously had lost it. Montgomery's typical infighting, body-belting method of combat, lacking the inspiration which enabled him to conquer Jack in a more spectacular 15-rounder in the same ring 23 weeks ago, was insufficient to carry him through his first defense of the title. Although hurt frequently by Monty's heavy blows, Jack always had the means and the energy to outscore him with lighter but far more numerous punches. The Beau was pretty tired at the finish, losing the last two rounds to the Bobcat's desperate closing rally, but by that time he had the decision well secured. Montgomery offered no protest, conceding that "the best man won," but promising to show more variety and imagination the next time he tackles Jack. "I knew what I should do but couldn't get myself to do it," he said. It seems as if nothing short of an earthquake will open the door to another challenger, for Beau Jack is bound by contract to give no one else a crack at the title before he defends it against Montgomery, probably in March. As usual, the Beau was a human dynamo last night, flinging fists with marvelous rapidity and accuracy from all positions and all directions. They smothered Montgomery at long and medium range, and often at close quarters, where the Philadelphian should have excelled. While Monty looked pretty sad at times, for a 17-5 favorite, he had his superlative moments, the best of them in the fifth round. That was when Jack, breaking out of a crouch, raised his head to slug it out with Bobcat and caught a terrific right cross on the chin that sent him staggering to the ropes. There he was overtaken by a furious volley of lefts and rights to the body which caused him to sag precariously. Before the round ended, however, he was bouncing around again, poking the Philadelphian with weak but disconcerting jabs. That was Montgomery's banner round. He had the advantage also in the second, third, eighth, 14th and 15th, but yielded eight of the remaining nine to Beau Jack. The tenth was even. 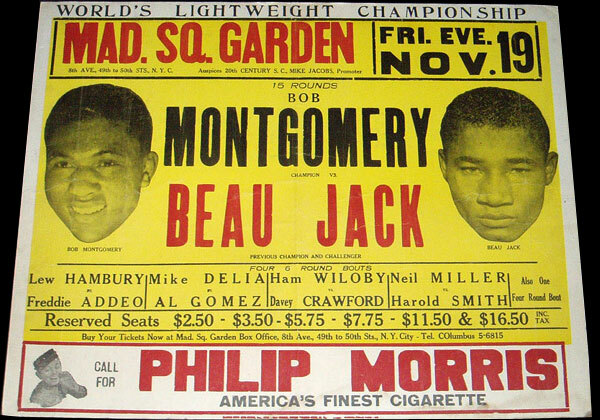 Could Beau Jack have brought as much power to bear in his swinging as Montgomery, he easily might have chopped his opponent down. As it was, he stung Bob with some of his looping lefts and rights, but most of his jabs, uppercuts, hooks and crosses were hardly more than annoying. He poured them in too quickly to develop telling force. The Beau slowed down deceivingly in the middle rounds, explaining afterwards that it was his way of conserving energy for the homestretch. He had his followers worried, however. Because it was a championship battle between two earnest and splendidly trained fighters, the contest was exciting to a degree. Without the title significance, it probably would have bored the crowd some of the time, especially when Montgomery and Beau Jack locked themselves in a clinch and struggled to hit each other through their close guards. Except for Beau Jack's momentary crisis in the fifth, neither man appeared in danger of being knocked off his feet. Both suffered facial disfigurement - bleeding lips and swellings around the eyes - but they came out of the match in good enough shape to show up at Mike Jacobs' office for a juicy payoff today. Jack's movements betrayed no ill effects of the injury which had cost him a humiliating defeat at the hands of Bobby Ruffin a month ago. He hurt his knee before that bout and was prevented from doing any training. His poor condition was reflected in his weight, for he came in at 140.5 pounds, more than he ever scaled before. For last night's match, the Beau was down to 132.75, a pound lighter than Montgomery. The latter's weight caused a mild surprise, though only half a pound less than he scaled for his first battle with Beau Jack last May 21. It was recalled that he hadn't been under 134 since that day, a year and a half ago, when he was badly beaten by Sammy Angott. Of the $96,873 gross gate contributed by 17,866 paying fans, Monty will get $25,000. His share will be 30 percent of the net, which will be about $82,000. Beau Jack fought for 25 per cent, and his purse will come to $20,000 or more. In their third meeting, the percentages will be reversed. Until they come together again, Montgomery will continue fighting minor opponents, some of them on the Pacific Coast. He had planned a trip to California long ago and said last night he would go through with it, unless something unexpected intervened.